Note: This advice isn't a substitute for medical advice. If you have a back problem then you must first consult with your doctor. The advice given here can injure you or make your injury worse. Every back injury is different and treatment should be done by medical professionals. This isn't a disclaimer, I really don't want you to get hurt. I'm sure most of you had a sore back, whether from intense training, arduous house work or just sitting way too much. A few of you have such bad backs that you can't even stand for a long time without your back getting fatigued - that was me at one point. What I'm getting at is that back pain is pretty common and is inevitable if you aren't actively taking care of yourself. Good news is that your back is really resilient and has incredible capacity to recover and get strong. I'm not going to get into the nitty gritty anatomy involved since it took me years to wrap my head around it, and I'm still learning. If you must know then I recommend the book Lower Back Disorders by Stuart McGill. There's enough back science that you can write a dissertation about it afterwards. Having said that lets just review what your back actually is. 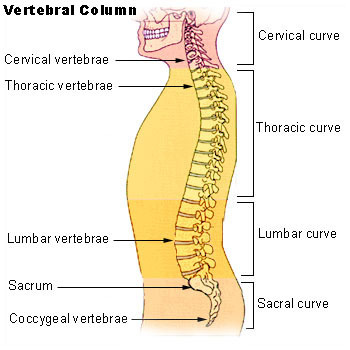 What I want you to focus on is the Thoracic spine and Lumbar spine. Usually when people talk about back problems they really are referring to the Lumbar spine. A mobile joint is one that should move through its full range of motion. An example would be your ankle or your wrist. 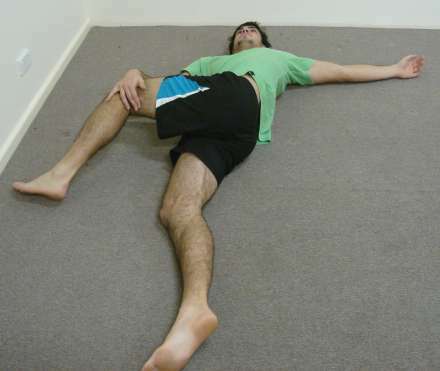 Mobile joints have different ranges and paths of motion but they should be able to move through them. On the other hand, stable joints have more limited directions of motion and should be trained in a much more rigid way. Stable joints would be like the Lumbar spine, knee, or elbow. Your knee for example: it should move back and forward. It should NOT move side to side. Yeah yeah. So the Lumbar spine's main function is to connect your torso with your hips. All the forces traveling up or down have to pass through it. For this reason it should always be stabilized and made rigid. Movements such as the scorpion or Russian twists are bad times. Why? Imagine the support beams of a building. What happens when you twist them? They lose their shape and become weaker. Not to mention they get stretched and lose their rigidness. Suddenly they can't carry as much weight and are susceptible to injury. As you can see his lower back is all twisted and turned away from the hip - more on this later. Do this if you want to destroy your back. Flexion means your spine is flexed or rounded. You see how it makes a curve? Back flexion makes your spine weaker and multiplies the carried load. This is why a lot of people hurt their back picking stuff up since they do it while their back is in flexion. Enough about the bad stuff, how do I fix this? Always maintain neutral -read: straight- spine. Improve Thoracic spine mobility - upper, not lower spine (See video). Your glutes are the biggest muscles in your body. Beyond powering your hips and the being workhorse of most exercises the hips provide core stability and strength. Often times back injury happen due to weak hips. What happens is that the lower back compensates for the hips and gets hurt. Those who are sedentary often end up with a muscle imbalance where their quadriceps are overdeveloped compared to their hip muscles. They also favor using their knees to bend rather than their hips. As such one of the main things is to learn how to sit back. If you have trouble telling apart the difference look at the shin angle in relation to the ground. Best way to train the glutes is by doing single leg movements (Lunges, step ups, split squat etc) and glute bridging movements.. I'm going to call this R2H. This is a concept that was crystalized to me from Dr McGill's teachings. Basically whenever you twist or turn, the movement has to come from the hip while at the same time the hip and the back should move in sync. Imagine if your hips and lower back were fused together and you couldn't twist one independently from the other, that's what you want to achieve. There's a lot more but this should keep you busy.